Every second of the day chemical reactions take place - both inside your body and around you. In a chemical reaction, one or more reactants change into one or more products. 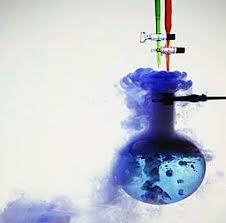 Chemists use a chemical equation to convey as much information as possible about what happens in a chemical reaction. There are five types of chemical reactions: combination, decomposition, single replacement, double replacement, and combustion.